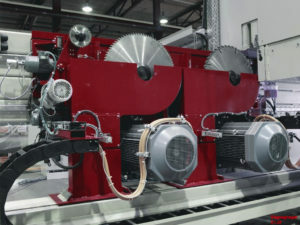 ANTHON’s Crosscut Saw LNC with double aggregates containing: 1 scoring saw, 1 main saw and 1 hogging unit. BAUMER’s ColourBrain Edge automatic optical inspection and process control will be displayed. ColorBrain Edge cameras are designed to be integrated in single- and double sided edge banding lines, with interfaces to any kind of production control, in the furniture and flooring industry. We are looking forward seeing you at the IWF again!